Optimize Your Satellite Internet Connection Simultaneously connect all your computers to the Internet with one Internet connection, eliminate multiple dial-ups, IP addresses and hardware. Supports both DirecPC/DirecWay and Starband. Orbit Internet Sharing Solution installs on just one of your network PC's. Its intelligent Install Wizard does away with network jargon and makes installation simple. Most businesses and households access the same pages on a regular basis. Orbit Internet Sharing Solution caches the sites that you surf, speeding up your Internet connection and making bandwidth available for other activities. Saves money by eliminating multiple phone lines, modems and user accounts. Orbit Internet Sharing Solution is expandable and can grow with your business. An intelligent Install Wizard makes installation simple. * Virus protection and site filtering are included free with purchase of Orbit Internet Sharing Solution for the first 6 months. Purchase of subscription is necessary after this period to use these features. 3-SF-12 Site Filtering Subscription for OrbitNet 3 Users. 5-SF-12 Site Filtering Subscription for OrbitNet 5 Users. 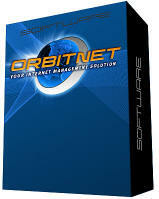 10-SF-12 Site Filtering Subscription for OrbitNet 10 Users. 25-SF-12 Site Filtering Subscription for OrbitNet 25 Users. 50-SF-12 Site Filtering Subscription for OrbitNet 50 Users. 100-SF-12 Site Filtering Subscription for OrbitNet 100 Users. 250-SF-12 Site Filtering Subscription for OrbitNet 250 Users. 3VP-12 Virus Protection - 3 user Virus subscription for 12 month renewals for OrbitNet-3. 10VP-12 Virus Protection - 10 user Virus subscription for 12 month renewals for OrbitNet-10. 5VP-12 Virus Protection - 5 user Virus subscription for 12 month renewals for OrbitNet-5. 25VP-12 Virus Protection - 25 user Virus subscription for 12 month renewals for OrbitNet-25. 50VP-12 Virus Protection - 50 user Virus subscription for 12 month renewals for OrbitNet-Unlimited. 100VP-12 Virus Protection - 100 user Virus subscription for 12 month renewals for OrbitNet-Unlimited. 250VP-12 Virus Protection - 250 user Virus subscription for 12 month renewals for OrbitNet-Unlimited. Send mail to DIRECPC@Orbitsat.com with questions or comments about this web site.